KUALA LUMPUR: While the European Union (EU) is set to gradually reduce the use of palm oil in biofuel, Malaysia as a major exporter is not at a complete lost. 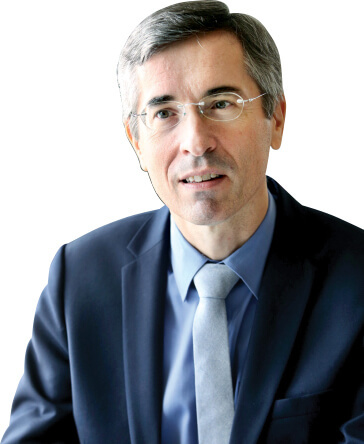 Rather it should now take the opportunity to improve production processes, said the French ambassador to Malaysia, Frédéric Laplanche. The EU, in its Renewable Energy Directive, had recently deferred the proposed total ban on palm biofuel to 2030 from the earlier date of 2021. The agreement on June 14, reached following a trilogue between the European Commission, the European Parliament and the EU Council, also stated that biofuels are to be assessed equally regardless of the source. It will not single out, nor ban, palm oil. Palm oil producers such as Malaysia and Indonesia expressed elation following the decision, after protesting that the EU would be practising crop apartheid against palm oil while other crops were to be allowed in biofuels. “Firstly there is to be no discrimination. But there will be criteria defined in the coming years to differentiate the biodiesel that has a positive impact on climate change as compared to the traditional fuels and the ones that have a negative impact. “We have to tackle this problem together. What we want to do now in order to face this transition period is to work with the producers in the respective countries to see what we can do. I think it would be positive in Malaysia as it would in Indonesia to curb and put a stop to deforestation,” he told The Edge Financial Daily. It was not a good policy to pretend there is no problem, Laplanche added. “We can work on it. Malaysia can also grow its production of palm oil by raising the efficiency of its crops. You can also have a policy towards smallholders,” he said. Looking at the current situation in Malaysia, the average yield per hectare is well below the potential, he added. “So by raising the agricultural technology used, you can raise the yield and continue to grow your production at the benefit of smallholders without extending the area cultivated or infringing upon the forest,” he said. Laplanche, therefore, hopes both countries would benefit from knowledge-sharing via increased communication. “We want to have a very close dialogue with the Malaysian authorities and producers on the issue. There are things that we can also share with the government, things that can be done here (in Malaysia) in order to raise the revenue of farming families. “We also have a French research centre in tropical agriculture present here which is working on these issues, such as raising the efficiency of cultivation and yield of palm oil,” he said. According to the Malaysian Palm Oil Council, Malaysia currently accounts for 39% of global palm oil production and 44% of world exports. Meanwhile, Laplanche commended the smooth transition in government, adding that rather than shaking investor confidence, it was the contrary. “From the point of view of French investors in Malaysia, there is no negative feeling about what has happened. It’s on the contrary. I think they appreciate a lot the idea of transparency including in public finances. They also appreciate the commitment made by the new government to stick to better governance in terms of public tenders for example. “Our companies, our investors, our financial sector actors are all in favour of open and competitive tenders. What I perceive from the discussions that I have within the French ecosystem here is that they are very positive with the direction taken by the government. The change is perceived as a movement which is going to make Malaysia more competitive. Laplanche also had the opportunity to meet Prime Minister Tun Dr Mahathir Mohamad, and said they were able to exchange views on future bilateral relations. “He has played a significant role in building the relationship; a lot of things we have today are thanks to his input. For example, the close proximity between France and Malaysia on security and defence. “But we did not talk about the past. We talked about the future and what is ahead of us,” he said. Commenting briefly on the development of Brexit, Laplanche said given that France is not for it, it will continue to negotiate discussions further in order to reach a conclusion which sees minimal economic impact on the region. “Brexit is supposed to happen at the end of March 2019. So we need to reach an agreement soon, hopefully by October. If there is no agreement it is still feasible. But the economic consequences for Britain will be very very heavy,” he said. As for any direct or indirect impact that may be felt on Malaysia, Laplanche said the United Kingdom (UK) used to be an important entry point for the country into the EU. “It is clear that this role would disappear and it (UK) would not be able to play that role after it has left the EU. So probably Malaysia would have to find other ways to develop its relationship with the EU. Regardless, the EU is very committed to its relationship with Malaysia,” he said. In 2017, trade between France and Malaysia grew by 8.2% from a year ago and stood at €4 billion. 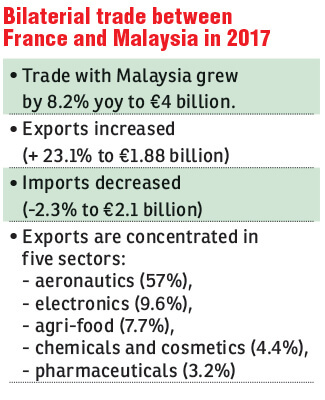 However France’s trade deficit with Malaysia decreased by 62% to €239 million. “This was supported by both an increase in our exports (+23.1%, €1.88 billion), mainly our aeronautical sales (+47.1%, €1.07 billion) and a slight decrease in our imports from Malaysia (-2.3%, €2.1 billion), in particular electronic components (-5%, €0.7 billion),” he said. French direct investment in Malaysia has tripled since 2010 to reach €1.4 billion at the end of 2017. France is the fourth largest European customer of Malaysia and second largest European supplier. There are more than 280 French companies in Malaysia currently including most of the major French groups. These companies represent a gross investment of RM6.5 billion and employ more than 25,000 Malaysians, Laplanche said.